Basically the whole area around Siem Reap is riddled with temples, all built in the Angkor period (think Roman period, but located in South East Asia). 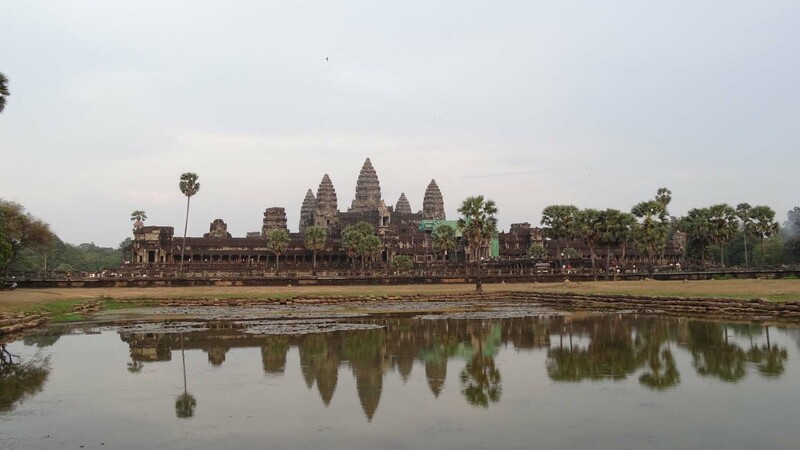 The Angkor period was from 802 to 1432, more than 600 years in which each king wanted to build a temple that was bigger and better than the previous one. We dedicated 2 full days to this area and in true Jon and Jude style we spent those days from sunrise to sunset walking, riding and driving around the many, many temples. After 25 hrs in 2 days we still hadn’t seen all of it, but we had admired most of them (and we were knackered!). We read the suggestions, highlights and must-do’s in preparation (= on the fly) and decided to do it differently to try to avoid the crowds. It was the best decision we made. 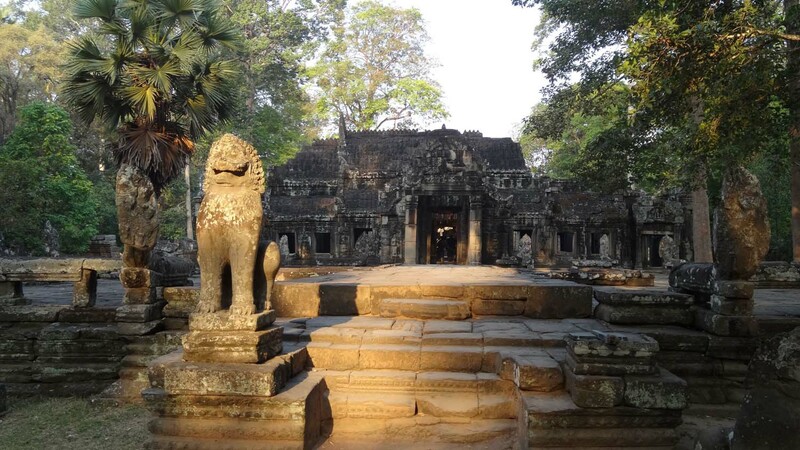 We spent sunrise at Ta Promh, which became our favourite of all temples, closely followed by Ta Nei (where we ate breakfast on the second day without anybody else around) and Preah Khan. Most people watch sunrise at Angkor Wat, but we didn’t go there until late in the afternoon when most tourists had already gone home or hiked up the hill of Phnom Bakeng to watch sunset on Angkor Wat. The temples are all beautiful and although there are a lot of similarities, it is amazing how different each temple still is. The one we liked best still has some trees growing all over the walls and gates, showing the slow attack from the jungle over many, many years. It’s also know as Tomb Raider temple as some scenes from the movie were shot here. Ta Nei was similar, with some trees still growing around it, but much smaller. It was also well off the beaten track and in the hour we spent there enjoying our breakfast and exploring the temple we only saw a handful of other tourists. 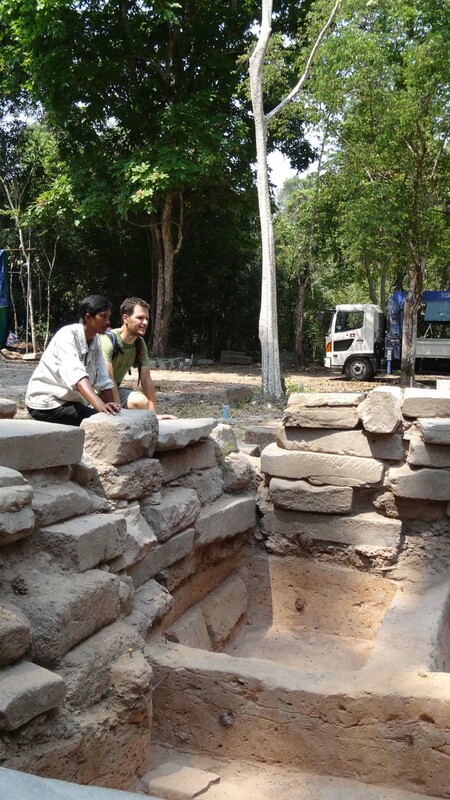 We spent some time with an archeologist in Angkor Thom at a tiny temple called West Prasat Top. It isn’t mentioned anywhere and we just stumbled upon it whilst cycling around Angkor Thom (10km2, it’s absolutely huge). It is fascinating to watch them dismantle one of the towers, build it back up, layer by layer, making new blocks where needed (if the original one can’t be found or is too damaged), excavating the site, checking the foundation (and making new discoveries) and finally building it all back up again. They were using some machinery to help them, but the finer work making new pieces was still being done by hand. Despite getting between 2-3 million visitors each year camping doesn’t seem to be popular and this is the first time we struggled to find a spot to spend the night, being chased away by police officers and security guards a few times. 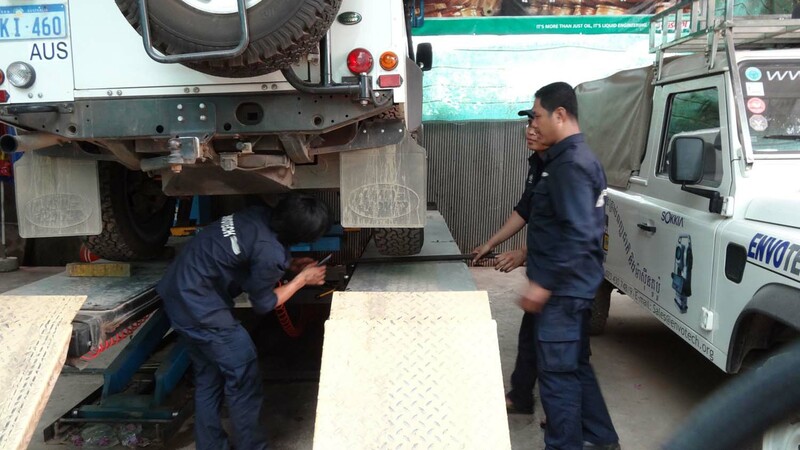 Siem Riep has everything you could possibly need, including great night markets, lots of restaurants, pubs, nightclubs and even a Land Rover garage where they could fix Lara. No, she didn’t break down, but the aircon died a few days before we got here and with 35 degrees in the shade around 9 in the morning we decided to spend a few hours getting it fixed. It also meant we could find a place to do some much needed laundry and do some shopping in town. If you haven’t been to Siem Riep yet, we can definitely recommend going here on your next holiday. It had been on my 100-things-to-do-before-I-die-list for a long, long time and it certainly lived up to its expectation. How did the locals go with a Australian Land Rover in town? Just found your travel blog, as I sit here doing research for a 4 vehicle trip to SE Asia in 14 months time, Our trip will only be 3 months out of Brisbane, but I was wondering have you used your roof tent much? And Do you need a carnet to get into Malaysia from Thailand? I have been told not. BTW LR aircon is front left in the passenger foot well and under the bonnet not anywhere near the rear right wheel. are you sure you are not hiding breakdown? What great photos of just the two of you all over the temples without a hoard of other tourists. Reminds me of times in Syria where we could scramble over the ancient ruins at Palmyra with no-one else in sight (and no entrance fee or fences or gates). happy birthday buddy! you’ll be pleased to know that my first trip to Scotia and i have injured by back from the 4WD we were in . . 8hrs of driving over bumps/holes, dirt roads etc . . . Nissan Navara Dual Cab 1. vs. Piotr 0. Should have gone in a Defender! Roads in Laos are worse and my back is great 🙂 Can’t quit now, you’ve got a wedding to pay for! gefeliciteerd met Jon en met je pa. Hoe gaat het verrder? Genieten denknik als we jullie verhalen en foto’s zien. Fijne dag en groetjes van allemaal. Happy Birthday Jon. I hope you are being well looked after by your own team of devoted apsaras. Great to hear that you are travelling well. I must say that I’ve not seen a hoist required for aircon repairs before – is there more to this or is it just British engineering at its best? Mr Geeeeeeee! You would love it here. Tim Tams available in Thailand btw. Hope you are living the reno dream! Great advice! 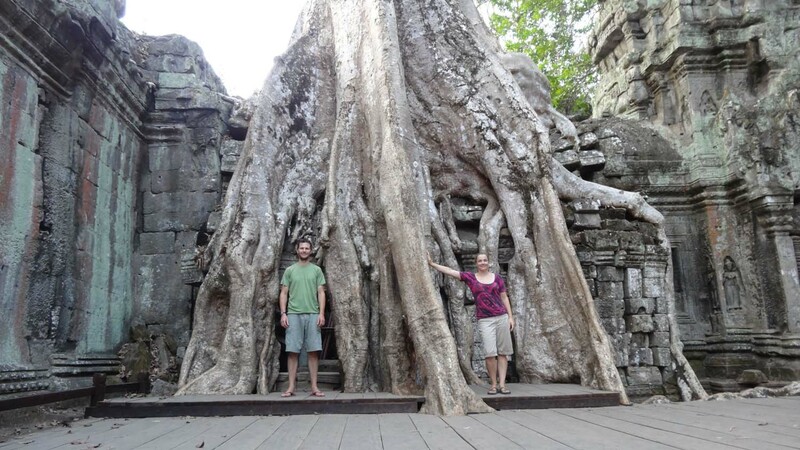 My wife and I were at Angkor in February; we too went to Ta Prohm and Bung Melea in the mornings, and found them deserted. 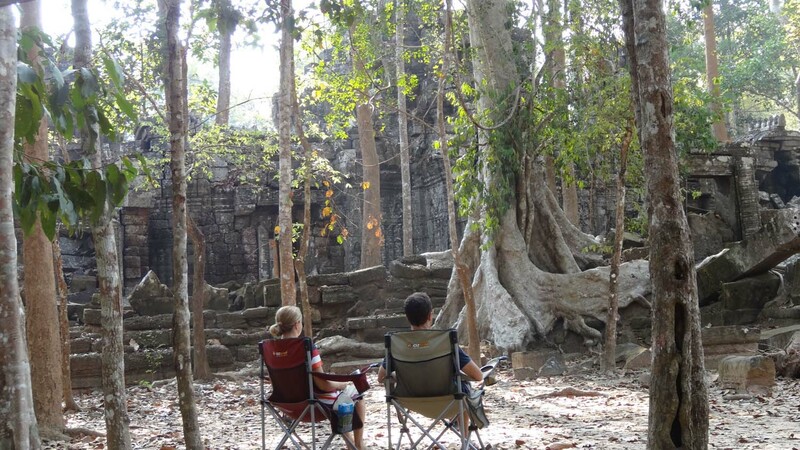 Great alternative to the thousands at Angkor Wat. It was definitely the best decision we made there! 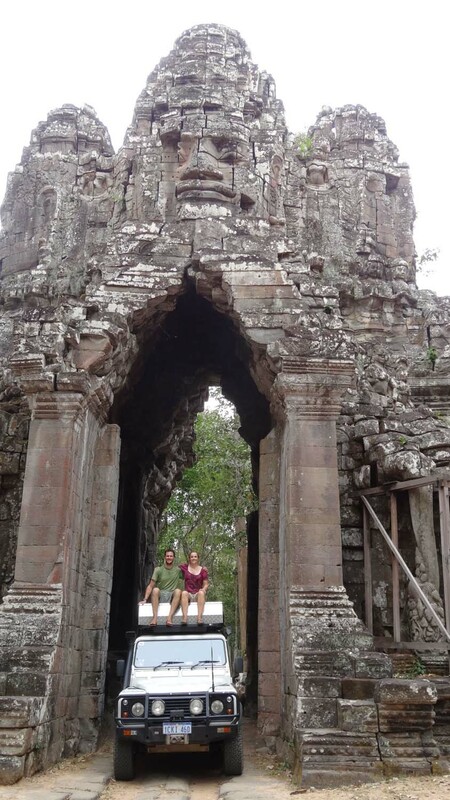 Hope you enjoyed the rest of Cambodia as much as we are too! I am really enjoying reading your posts. Very cool how you have seen the Angkor without the crowds. Seeing the archiologists would have added an extra dimension. Where were you camping at Angkor and how are the bikes holding up on the back of Lara? I assume you just have them on a bike rack? Such beautiful photos and great tales, thanks for the great posts ­ loving following the trip and living the adventures a little vicariously! !